The mama pig is clearly getting the job done. 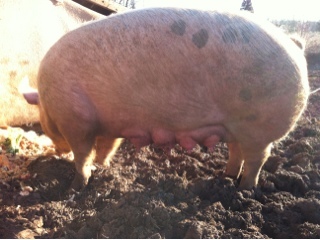 The piglets have grown dramatically and are looking fat and happy. They scamper about, have learned to eat solid food and are clearly working their momma too. She has been patient and sweet. Well, I actually don't test that, I stay on my side of the electric fence so all is well.